The term MOBA – or online multiplayer battle arena – is one of the least descriptive genre names in video games. It’s as obtuse as many of the games occupying that space. Awesomenauts, however, is different. Instead of being complex and near indecipherable for the first hundred hours, it’s simple and straightforward. It’s a MOBA that’s welcoming towards newcomers, but still deep enough for veterans to enjoy. And now having made the move to PlayStation 4 under the title Awesomenauts Assemble, it becomes even more accessible than before. The basics of MOBAs are relatively simple. You take control of one of 15 distinct characters and attempt to destroy the enemy base. The catch is that, in addition to your team, you’re supported by AI-controlled minions called “creeps,” which serve both as an extra line of offense and a never-ending resource of experience (or solar). With this solar, you level your character up by purchasing new abilities and upgrading their basic stats. Things like extra health, faster movement, increasing the range of their attacks, adding status inflictions, and so on. It’s essentially a game of assault with character progression. That’s an overly simple explanation of the genre, but in Awesomenauts’ case, it works because it really is that simple here. 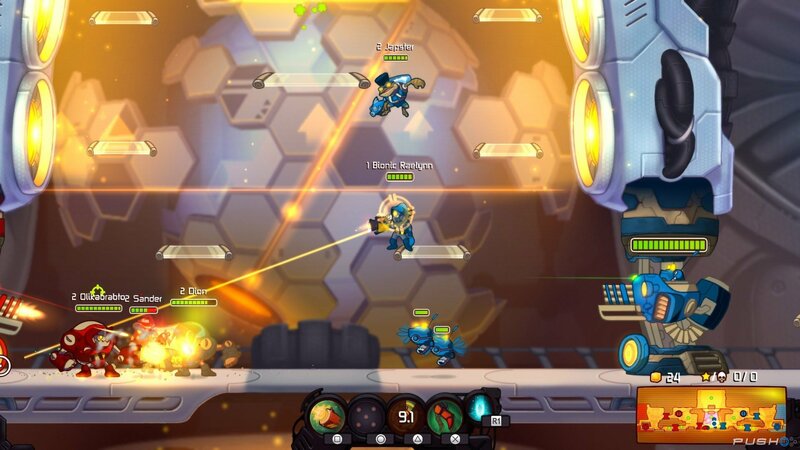 Awesomenauts reduces the MOBA structure down to its very basics, casting aside the needless complexities in favor of making a strong, easy to understand introduction to the genre, which is its greatest strength. Especially to someone like me who doesn’t have the time or energy to learn something like Dota 2 or League of Legends due to their absurd levels of complexity. A swift tutorial gets you familiar with the basics, practice mode letting you then hone your skills and see how each of the 15 characters play before jumping online. More importantly, playing practice rounds allows you to still unlock everything – from characters to maps and abilities – which helps make any time spent in there worthwhile. The AI provides a fair challenge as well, so you could theoretically play practice rounds only and still have a good time. If you do plan to jump online, however, it helps to become familiar with at least a few different characters. Each character has their own unique play style. Leon, for instance – an anthropomorphic chameleon – is outfitted with a sword and can cloak himself to create clones that act as decoys, thus making him more of a stealth character, while the lumbering robotic Clunk is slower but heavily armored and equipped with rockets, settling into the tank role nicely. The rest of the usual archetypes – support, defense, etc. – are all represented as well. Learning the basics of their play styles doesn’t take long, but mastering them is another matter entirely. Awesomenauts is essentially a game of tug-of-war. Both teams work to destroy the other’s base, but turrets and hordes of droids stand in the way. You have to stay on the offense constantly, as that’s the fastest road to victory, but not at the cost of defense. A poor balance of those two easily spells disaster, giving the opposing team a perfect chance to trounce you. Teamwork is key. An out of sync team won’t emerge victorious, except in cases where the other side is just as uncoordinated. Luckily, it’s easy to work together: just pay attention to their movements and help whenever necessary. Going off and doing your own thing does no one any good. Concentrated efforts always make a bigger difference, even if it’s delaying the inevitable landslide loss. Turns you into an easier target, too. You can issue a few commands through the d-pad, such as attack, defend, calling for help, or even taunting the enemy, though their effectiveness depends entirely on your team’s willingness to listen. 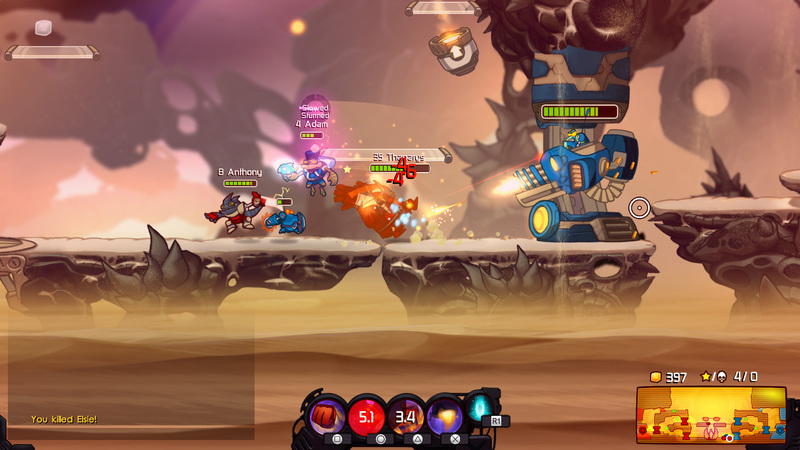 Awesomenauts only has four maps, but that’s plenty for this sort of game. Each has their own gimmick that lends them plenty of unique tactics to employ. For instance, in one map, there lies a monster in the center of the field that emerges when a button is pressed, instantly killing whatever and whomever happens to be in its grasp. Another ditches the multiple paths and funnels everyone into a single room to duke it out in, complete with low gravity. The differences seem small, but their impact on the flow of the match cannot be understated. As of this writing, the community is still very active. It takes mere seconds to find a game, connectivity issues a rare sight. Everything runs smoothly, not a single hitch in sight. It’s everything you could ask for in a port like this. That it’s also a fine introduction to MOBAs, let alone one that works splendidly on console, is a bonus.